Launch from the Baikonur Cosmodrome (Michael Fincke and Yuri Lonchakov with Soyuz TMA-13). Sandra Magnus arrived on November 16, 2008 with STS-126. She was replaced by Koichi Wakata on March 17, 2009 (arrival with STS-119). The Expedition 18 officially began with undocking of Russian spacecraft Soyuz TMA-12 on October 24, 2008 at 00:16 UTC and Expedition 17 ended. STS-126 docked with the International Space Station on November 16, 2008. 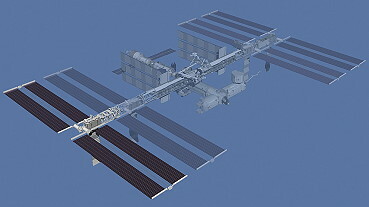 STS-126 (ISS-ULF-2 MPLM Leonardo) included the Leonardo Multi-Purpose Logistics Module (MPLM) on its fifth spaceflight. Leonardo held over 14,000 pounds (6,350 kg) of supplies and equipment. Among the items packed into the MPLM were two new crew quarters racks, a second galley (kitchen) for the Destiny laboratory, a second Waste and Hygiene Compartment (WHC) rack (lavatory), the advanced Resistive Exercise Device (aRED), two water reclamation racks, spare hardware, and new experiments. Also included in Leonardo was the General Laboratory Active Cryogenic ISS Experiment Refrigerator, or GLACIER, a double locker cryogenic freezer for transporting and preserving science experiments. The shuttle also carried irradiated turkey, candied yams, stuffing and dessert for a special Thanksgiving meal at the station, as well as an Official Flight Kit with mementos for those who supported the astronauts and helped them complete their mission successfully. The crew conducted four spacewalks to service and lubricate the complex's two Solar Alpha Rotary Joints (SARJ) that allow the station's photovoltaic cells to revolve like paddlewheels and point at the sun. The starboard SARJ has had limited use since September 2007. The spacewalkers also installed a new nitrogen tank, a global positioning system, antenna, and a camera on the station's Integrated Truss Assembly. The shuttle delivered a new Flight Engineer, Sandra Magnus to join the Expedition 18 crew, and return Flight Engineer Gregory Chamitoff to Earth. Also carried was a Lightweight MPESS Carrier (LMC) carrying a Flex Hose Rotary Coupler (FHRC) and returning a Nitrogen Assembly Tank from 'Quest' for refurbishment. There are two Solar Alpha Rotary Joints (SARJs) on the International Space Station. They connect the Port 3 and Port 4 (left side) truss segments and the Starboard 3 and Starboard 4 (right side) segments. P3/P4 was flown up on the STS-115 mission on September 09, 2006, while S3/S4 was flown up on the STS-117 mission June 08, 2007. The SARJ is a 10.5-foot diameter (129.5 inch = 3.2 meters) rotary joint that tracks the sun in the alpha axis that turns four port and four starboard solar arrays wings. The eight solar array wings (on P4, P6, S4 and S6) are used to convert solar energy to electrical power. The SARJ continuously rotates to keep the solar array wings on S4 and S6 and P4 and P6 oriented toward the sun as the station orbits the Earth. The SARJ rotates 360 degrees every orbit or about 4 degrees per minute. The SARJ weighs approximately 2,506 pounds (1,137 kg) and is made of aluminum and corrosion resistant steel. The major components of the SARJ are the Utility Transfer Assembly (UTA), Trundle Bearing Assemblies (TBA) (12 per joint), race rings (2 per joint) and Drive/Lock Assembly (DLA) (2 per joint) and the Rotary Joint Motor Controller (RJMC) (2 per joint). The SARJ can spin 360 degrees using bearing assemblies and a control system to turn. All of the power flows through the UTA in the center of the SARJ. A large 10.5-foot (129.5-inch = 39.5 meters diameter), 229-pound (104 kg) geared race ring is secured to the structure by the TBAs and driven by the DLA using the software control commanded from the DLA/RJMC pair. The DLA engages the teeth of the race ring to rotate the SARJ. The gold plating on the TBA rollers is transferred from the roller to the race ring to lubricate the ring to create a lubricating film. Each SARJ has two race rings, an inboard race ring that is attached to the P3 or S3 truss and an outboard race ring that is attached to the P4 or S4 truss segment. The 12 TBAs are attached to the inboard SARJ race ring via mounts that do not rotate. The TBAs are the structural connection in orbit between the inboard and outboard race rings. The DLA also are attached to the inboard SARJ structure and have "follower assemblies" that act in the same fashion as the TBAs, helping to locate the driving gear relative to the race ring teeth. The UTA is an electrical roll ring assembly that allows transmission of data and power across the rotating interface so it never has to unwind. The UTA passes through the center, or hub, of the joint so it interfaces with both the inboard and outboard segments. The roll ring assemblies allow the outboard elements to rotate relative to the inboard elements while providing continuous data and power transmission. A few hours after Endeavour's docking on the third day of the flight, Sandra Magnus and Gregory Chamitoff exchanged custom-made Russian Soyuz spacecraft seat liners. 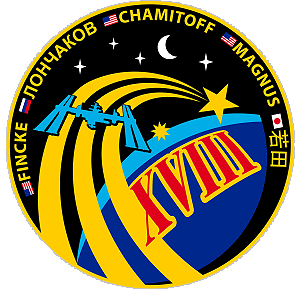 With that exchange, Sandra Magnus became a part of the Expedition 18 space station crew, and Gregory Chamitoff became part of Endeavour's crew. Sandra Magnus joined Expedition Commander Michael Fincke and Flight Engineer Cosmonaut Yuri Lonchakov who were launched to the complex in the Soyuz TMA-13 spacecraft on October 12, 2008 from the Baikonur Cosmodrome in Kazakhstan. 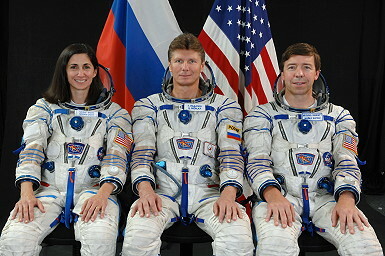 In the spring 2009, Sandra Magnus returned to Earth on shuttle mission STS-119, while Michael Fincke and Yuri Lonchakov returned in the Soyuz in April 2009. The first EVA by Heidemarie Stefanyshyn-Piper and Stephen Bowen occurred on November 18, 2008 (6h 52m) to replace a depleted nitrogen tank and a device used to help the flow of coolant from the truss, the backbone of the station. They also removed thermal covers from the Japanese Kibo module to inspect the berthing mechanism where the module's exposed facility will be installed during the STS-127 mission in 2009. They also started inspecting, cleaning and lubricating the starboard SARJ and begin replacing 11 of 12 trundle bearings. 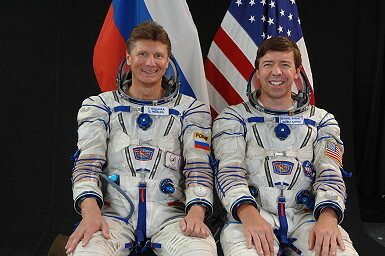 One was replaced during the STS-124 mission in June 2008. The first order of business was to swap the external equipment just delivered by the space shuttle with equipment that was brought back to Earth. Heidemarie Stefanyshyn-Piper removed an empty nitrogen tank assembly that has been waiting on the external stowage platform 3 on the port, or left, side of the station's truss since the June 2008 STS-124 mission. After installing a foot restraint on the end of the station's robotic arm to stand in, Heidemarie Stefanyshyn-Piper removed the tank and carried it as she rode the arm to the shuttle's cargo bay. Stephen Bowen helped Heidemarie Stefanyshyn-Piper remove the nitrogen tank, then took care of some minor tasks, including retrieving a camera and closing a window flap on Harmony's zenith common berthing mechanism. Stephen Bowen met Heidemarie Stefanyshyn-Piper in the cargo bay to help stow the tank and remove a spare flex hose rotary coupler, or FHRC. FHRCs are used to transfer liquid ammonia across the rotary joints that allow the station's radiators to rotate. Heidemarie Stefanyshyn-Piper carried the FHRC back to the stowage platform via robotic arm, where she and Stephen Bowen installed it for future use. Then, while Heidemarie Stefanyshyn-Piper climbed off of the robotic arm, Stephen Bowen removed some insulation from the common berthing mechanism that was used to attach the Japanese external facility to the Kibo laboratory. When those tasks were done, the spacewalkers started the mission's first round of starboard SARJ maintenance. The rotary joint has 22 protective insulation covers, of which no more than six can be removed at any one time. Heidemarie Stefanyshyn-Piper began by opening cover eight. Cover seven was removed and left off during an inspection on a previous spacewalk. With the insulation covers removed, Heidemarie Stefanyshyn-Piper had access to the 10th of the joint's trundle bearing assemblies, or TBAs, which connect the two halves of the joint and allow one side to rotate while the other stays still. Meanwhile, Stephen Bowen worked under covers 22 and one, on TBA six. With the covers removed, Heidemarie Stefanyshyn-Piper and Stephen Bowen then removed their respective TBAs and stowed them in special bags designed to hold one TBA apiece. With that equipment out of the way, the spacewalkers were able to begin cleaning the area under the open covers. First, they used a wet wipe to remove debris from the cleaner areas of the joint, then to clean off the damaged outboard outer canted surface. Next, they used a grease gun to add a line of grease to the outer canted surface and used a scraper similar to a putty knife to remove some of the debris that has become "pancaked" on the surface. They cleaned the scrapers off inside of a debris container to prevent metal flakes from floating away, and then used a dry wipe to remove the grease from the area. Then they gave the entire area a final wipe with a dry wipe to remove any residual grease and debris. Once the area is clean, the astronauts could begin lubricating the surface of the outboard ring. They use a grease gun with a special, j-shaped nozzle to add grease to the inner canted surface, and a straight-nozzle grease gun for the outer canted and datum A surfaces. Finally, before closing the covers, Heidemarie Stefanyshyn-Piper and Stephen Bowen installed clean trundle bearing assemblies in place of the ones they removed. Heidemarie Stefanyshyn-Piper then repeated the process on TBA 11, under covers nine and 10. However, she did not reinstall TBA 11 until the second spacewalk. About halfway into the spacewalk, one of the grease guns that Heidemarie Stefanyshyn-Piper was preparing to use on the SARJ released some braycote grease into her crew lock bag, which is the tool bag the spacewalkers use during their activities. As she was cleaning the inside of the bag, it drifted away from her and toward the aft and starboard portion of the International Space Station. Inside the bag were two grease guns, scrapers, several wipes and tethers and some tool caddies. Stephen Bowen then shared bag and equipment with her. On flight day 6 there were no EVA activities and the crew installed two crew quarters racks into the Harmony node, and installed a rack with equipment to be returned to Earth into the MPLM (Leonardo). The crew also began working on activating the Water Recovery System, so that samples of water from two areas could be taken and returned to Earth with Endeavour. The second EVA was performed by Heidemarie Stefanyshyn-Piper and Robert Kimbrough on November 20, 2008 (6h 45m) to relocate two equipment carts, setting the stage for the installation of the starboard S6 truss (scheduled for February 2009). The spacewalkers also lubricated the end effector, or hand, of the Canadarm2, the station's robotic arm. They also continued lubricating the starboard SARJ and replacing trundle bearings. The first task of the second spacewalk gave Robert Kimbrough a chance to ride the station's robotic arm. He and Heidemarie Stefanyshyn-Piper moved the station's two Crew and Equipment and Translation Aid, or CETA, carts, the rail carts that allow astronauts to move equipment along the station's truss, from their current homes on the starboard side of the station's Mobile Transporter (MT) to the port side. Heidemarie Stefanyshyn-Piper got the carts ready for transfer by moving them into position and unlocking their wheel bogies. Robert Kimbrough first carried CETA 1 and then CETA 2 as he was flown on the robotic arm from one side of the MT to the other. Heidemarie Stefanyshyn-Piper met him there each time, to install the carts in their new locations. When that task was done, Robert Kimbrough climbed off of the robotic arm and removed the foot restraint Heidemarie Stefanyshyn-Piper installed on the first spacewalk. This gave him access to the arm's latching end effector, or LEE, the snares that allow it to grasp equipment. Inside the station, Donald Pettit and Sandra Magnus commanded the LEE, which has been experiencing some sticky spots, to open and close its snares. Robert Kimbrough applied lubricant to the LEE's snare bearings and rotated the bearings using needlenose pliers to ensure the lubricant covers the bearings. Meanwhile, Heidemarie Stefanyshyn-Piper returned to the starboard SARJ to continue its cleaning and lubrication. Following the first spacewalk, the SARJ was rotated so that the areas Heidemarie Stefanyshyn-Piper and Stephen Bowen already cleaned were under the joint's two drive lock assemblies, which cannot be removed easily. Heidemarie Stefanyshyn-Piper reopened covers nine and 10 and cleaned the new area under them, before reinstalling TBA 11, which she removed during the first spacewalk, and reclosing the covers. Next Heidemarie Stefanyshyn-Piper removed and replaced TBAs eight and nine under cover five. When Robert Kimbrough finished his work on the robotic arm, he joined her at the SARJ and work on TBAs 12, under covers 11 and 12. On flight day 8 Michael Fincke and Sandra Magnus tested latches on the Exposed Facility Berthing Mechanism for the Japanese Kibo laboratory. Sandra Magnus continued with the installation of the Total Organic Carbon Analyzer (TOCA), while engineers on the ground worked through troubleshooting of the Urine Processor Assembly. The component ran initially on Thursday evening, but shut itself down during that initial test, and shut down again the following morning after two hours of operations. 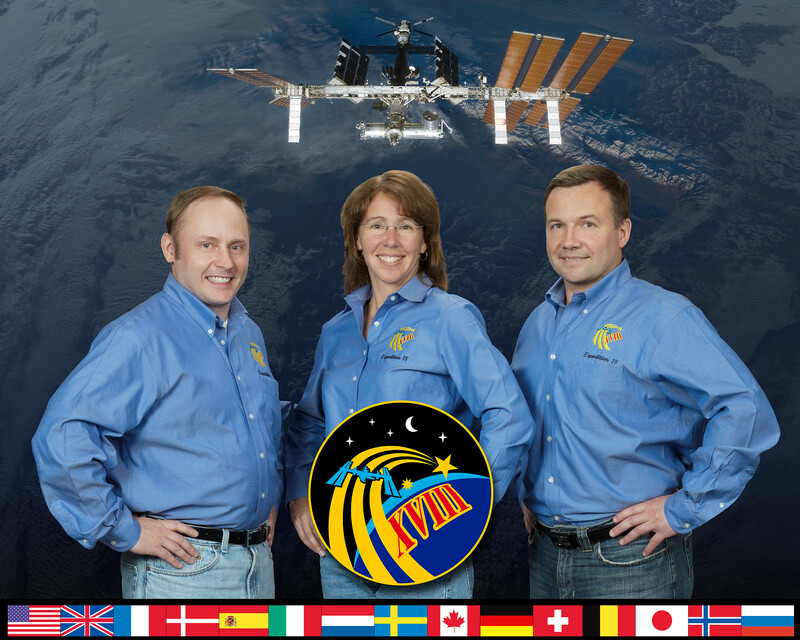 The third EVA by Heidemarie Stefanyshyn-Piper and Stephen Bowen was conducted on November 22, 2008 (6h 57m) to complete starboard SARJ cleaning, lubricating and trundle bearing work. The third spacewalk of the mission was completely devoted to work on the starboard SARJ. Using the same methods, Heidemarie Stefanyshyn-Piper opened covers 13 and 14, removed TBA one, cleaned and lubricated the area, installed a new TBA and closed the covers. She repeated the process on TBA two under covers 15 and 16 and TBA three under covers 17 and 18. Stephen Bowen did the same for TBA four under covers 19 and 20, TBA six under covers 22 and one and TBA seven under covers two and three. He also removed TBA five under cover 20; however, it was replaced on a previous spacewalk, so he simply cleaned and re-installed it. 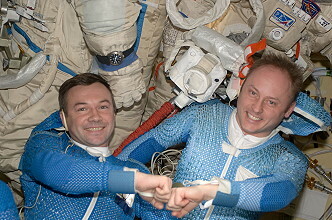 The two crews (Station and Shuttle) continued transfer operations on Flight day 10, and Michael Fincke and Donald Pettit worked together to reconfigure the Urine Processing Assembly (UPA) to try to dampen any vibration that may be contributing to the unit's shutting down prematurely. The unit had continued to operate sporadically, shutting itself down after two to three hours of operations, and the engineers on the ground were still evaluating the possible causes and solutions. The fourth and final EVA by Stephen Bowen and Robert Kimbrough was performed on November 24, 2008 (6h 07m) to remove several thermal covers on the port SARJ. Robert Kimbrough lubricated the port SARJ, while Stephen Bowen reinstalled the thermal insulation covers (removed on first EVA) on Kibo. He then installed two GPS antennas on Kibo's logistics module, while Robert Kimbrough installed a new TV camera on the truss. Meanwhile the managers on the groud had decided to extend Endeavours mission to allow the crews more time to resolve the issues with the Urine Processing Assembly. And the UPA finally appeared to be functioning normally after the modifications performed by the crew on orbit. The mission's final spacewalk required careful coordination, as the spacewalkers performed preventative maintenance on the station's port SARJ, which currently was functioning well. Robert Kimbrough had just the one spacewalk to lubricate the same surface area that was lubricated over three spacewalks on the starboard side. To make that possible, he and Stephen Bowen opened covers 6, 7, 10, 11, 14 and 15, and left them open for most of the spacewalk. Robert Kimbrough then lubricated the exposed area and moved away so that flight controllers on the ground could rotate the joint 180 degrees. That helped spread the grease, and expose new, unlubricated areas under the open covers. While the joint was rotating, Robert Kimbrough returned to the Quest airlock to retrieve a video camera. He installed the camera on the first port segment of the station's truss, where it will be used next year to provide views of the robotic arm's capture and docking of the first Japanese H-2 Transfer Vehicle. Robert Kimbrough then moved back to the port SARJ, greased the newly exposed areas and closed the covers. Meanwhile, Stephen Bowen worked on several projects at the Japanese Kibo module. He reinstalled the common berthing mechanism's insulation that he removed during the first spacewalk. Next, he tucked in the module's robotic arm grounding tabs, which are obscuring the view of the arm's camera, by wrapping the tabs around a cable and Velcroing them together. Afterward, Stephen Bowen installed three spacewalk handrails, two worksite interfaces and two Global Positioning Satellite (GPS) antennae on Kibo's exterior. The H-2 Transfer Vehicle will use the GPS antennas to navigate to the space station. Both astronauts wrapped up the spacewalks by taking photographs. Stephen Bowen photographed the radiators on the first port and starboard truss segments, using both regular and infrared cameras. In September 2008, ground controllers noticed damage to one panel of the starboard radiator. Blemishes have been noticed on the trailing umbilical system cable of the mobile transporter, so Robert Kimbrough was asked to photograph it as well. The photographs were used by teams on the ground to determine the cause of the damage and blemishes and decide what action, if any, should be taken. On November 26, 2008 Donald Pettit and Robert Kimbrough used the station's Canadarm2 to move Leonardo from the Harmony module and placed in the shuttle's cargo bay at 21:52 UTC. Heidemarie Stefanyshyn-Piper packed up equipment and supplies used for the four spacewalks and moved them to Endeavour for return, while Sandra Magnus continued work on the station's new regenerative life support system. She drained a condensate collection tank to create the optimum ratio of condensate and distillate from the Urine Processor Assembly (UPA), and gathered additional water samples for testing. On November 28, 2008 STS-126 undocked from the ISS and moved to a distance of about 450 feet (137.2 meters), where Eric Boe began to fly around the station. Once Endeavour completed 1.5 revolutions of the complex, Eric Boe fired Endeavour's jets to leave the area. The shuttle moved about 46 miles (74 km) from the station and remained there while ground teams analyzed data from the late inspection of the shuttle's heat shield. The distance was close enough to allow the shuttle to return to the station in the unlikely event that the heat shield is damaged, preventing the shuttle's safe re-entry. Progress M-01M was launched at 12:38 UTC on November 26, 2008. Immediately after launch, an antenna used by the spacecraft's Kurs docking system failed to deploy. The antenna was successfully deployed about three hours later after flight controllers resent the deployment command, however the spacecraft was docked using the backup TORU system, controlled by cosmonaut Yuri Lonchakov, as a precaution. 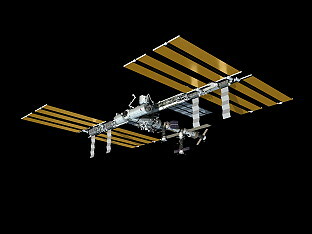 Following a four day free flight, it docked with Pirs module of the ISS at 12:28 UTC on November 30, 2008. Progress M-01M carried 2,423 kilograms (5,342 lb) of cargo, consisting of which 820 kilograms (1,810 lb) of fuel, 210 kilograms (460 lb) of water, and 1,343 kilograms (2,961 lb) of dry cargo. 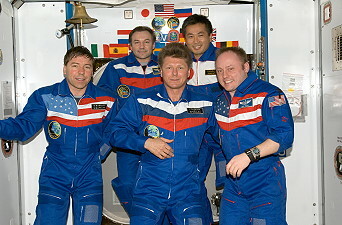 The dry cargo included Japanese food for Koichi Wakata, who arrived aboard the station in March 2009 as part of Expedition 18. 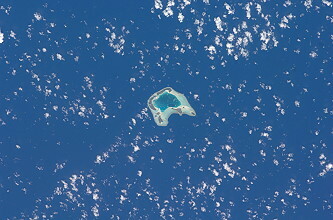 It remained docked until February 06, 2009, when it undocked at 04:10 UTC. It subsequently spent two days in free flight, before being deorbited, and burning up in the atmosphere at 08:19 UTC on February 08, 2009. 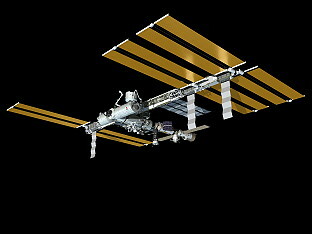 The first station EVA by Michael Fincke and Yuri Lonchakov occurred on December 23, 2008 (5h 38m) to deploy and retrieve several Russian experiments on the station's exterior and installing a device to measure electromagnetic forces imparted on station hardware as the complex moves through low Earth orbit. They installed a Langmuir probe on Pirs to measure electromagnetic energy to determine its effects on pyrotechnical separation bolts on Soyuz. Michael Fincke removed Biorisk experiment canister from outside of Pirs, and he and Yuri Lonchakov put it back inside the airlock. They then installed the two new experiments, Expose-R and Impulse, on Zvezda. Conducted by ESA, Expose-R, like the Biorisk experiment, exposed biological substances to outer space. Impulse measured disturbances in the ionosphere surrounding ISS. They were able to connect both experiments in spite of having trouble with some stubborn cables. Moscow flight controllers relayed that the Impulse experiment was functional but they did not receive telemetry from Expose-R. Therefore, they ordered the pair to disconnect Expose-R and bring it back with them to Pirs. Progress M-66 was launched at 05:49 UTC on February 10, 2009. This was the first time Site 31 had been used for a Progress launch since Progress M-15 in 1992. The spacecraft docked with the Pirs module of the ISS at 07:18 UTC on February 13, 2009. Progress M-66 delivered supplies to the International Space Station, including fuel, food and water for the crew, and equipment for conducting scientific research and establishing a 6-man crew capacity aboard the ISS. It also carried a new Orlan-MK spacesuit to replace one of the older Orlan-M suits previously used for EVA's from the station. 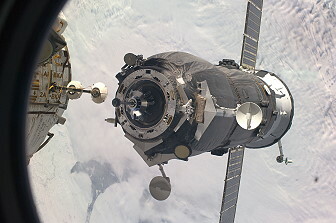 The freighter undocked at 15:18 on May 06, 2009, to make way for Progress M-02M. It was deorbited at 14:28:30 on May 18, 2009 following twelve days of free flight, during which it conducted experiments as part of the Plazma-Progress program. Any debris from Progress M-66 that survived re-entry landed in the Pacific Ocean at around 15:14:45 UTC. 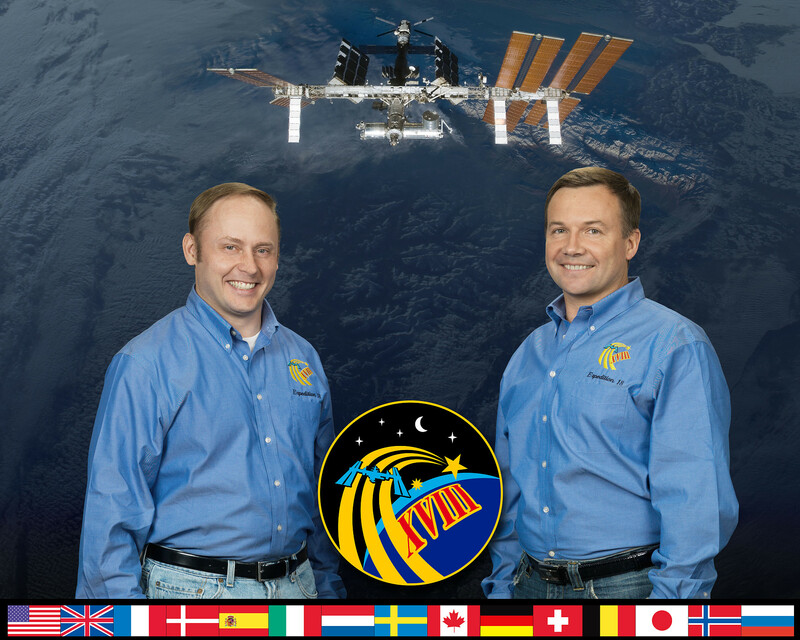 The second and final EVA was performed again by Michael Fincke and Yuri Lonchakov on March 10, 2009 (4h 49m). They brought the Expose-R experiment back to Zvezda, re-attempting to install it. This time the installation was a success. They also removed tape on Pirs' docking target and docking compartment to ensure that it would not interfere with the arrival of Soyuz or other spacecraft. The pair concluded their walk by taking photographs of the exterior of the Russian portion of ISS. This was to assess the current condition of the Station's surface and its mechanical components after having been exposed to the harsh environment of space for 10 years. On March 12, 2009, a piece of debris from the upper stage of a Delta II rocket used to launch a GPS satellite in 1993, passed close to the ISS. The conjunction between the debris and the Space Station was not detected until it was too late to perform a collision avoidance maneuver. 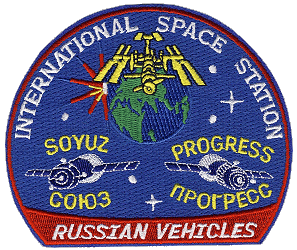 The crew prepared to evacuate the station by closing hatches between modules, and boarding the Soyuz spacecraft that was docked to provide emergency crew escape. 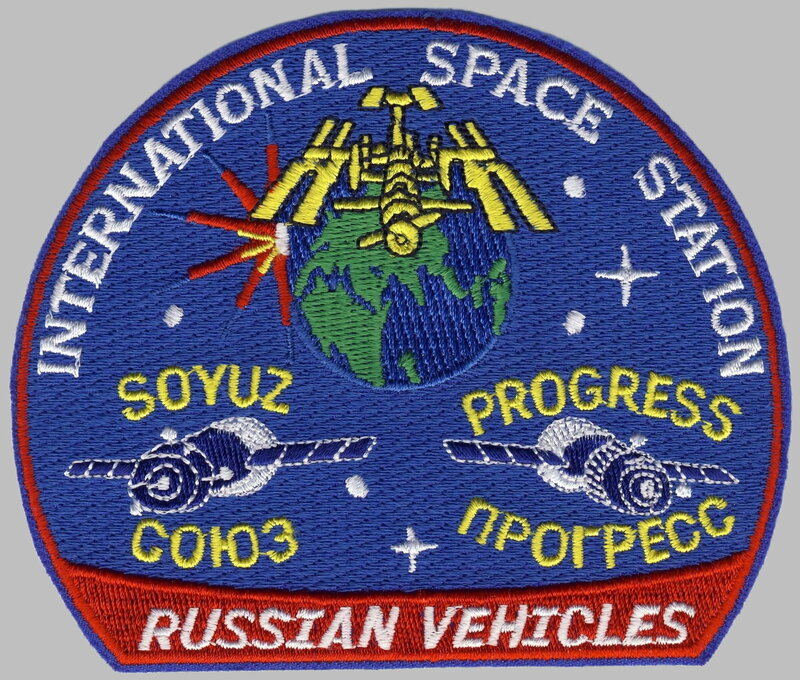 The debris did not hit the station, instead it passed by at 16:38 UTC, and the crew were cleared to resume operations about five minutes later. 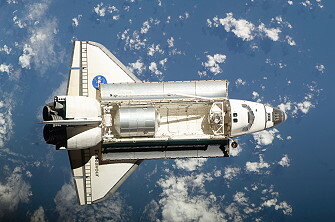 STS-119, the next Space Shuttle docked with the International Space Station on March, 17, 2009. STS-119 (ISS 15A ITS-S6) delivered and assembled the fourth starboard Integrated Truss Segment (S6), and the fourth set of solar arrays and batteries to the station. 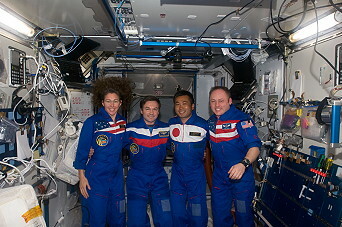 Koichi Wakata remained on the station, joining Expedition 18 Commander Michael Fincke and Flight Engineer Yuri Lonchakov. 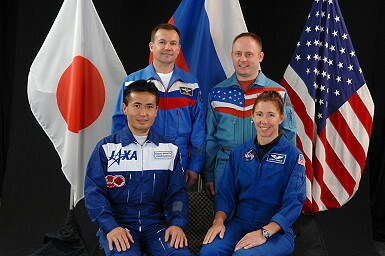 Koichi Wakata replaced Expedition 18 Flight Engineer Sandra Magnus, who returned to Earth with the STS-119 crew. Koichi Wakata served as a Flight Engineer for Expeditions 18 and 19. 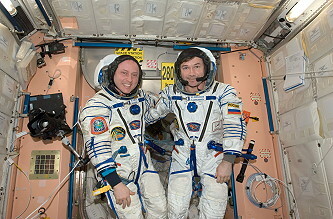 Michael Fincke and Yuri Lonchakov were launched to the complex in the Soyuz TMA-13 spacecraft on October 12, 2008, from the Baikonur Cosmodrome in Kazakhstan. 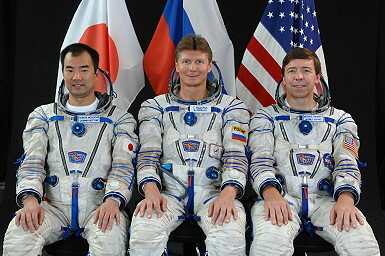 Koichi Wakata returned to Earth on shuttle mission STS-127, while Michael Fincke and Yuri Lonchakov returned in the Soyuz in April 2009. 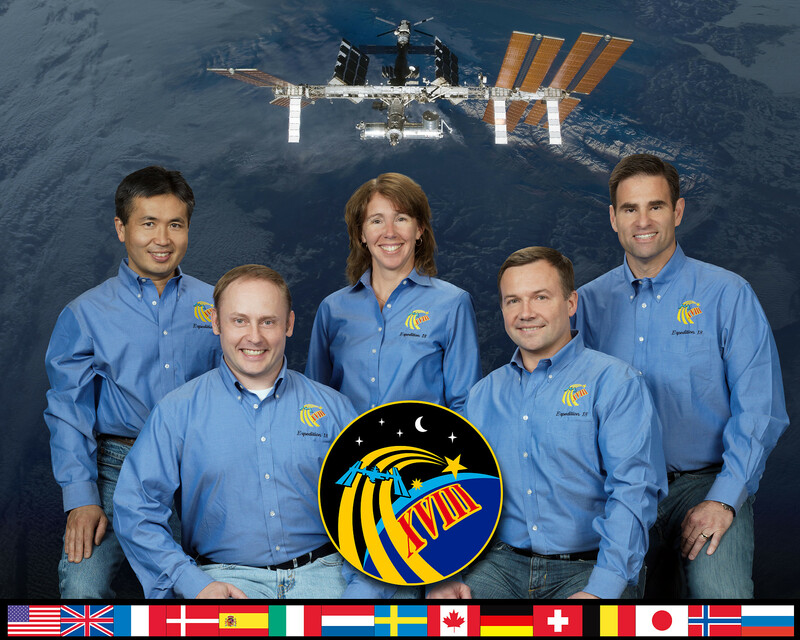 STS-119 delivered the International Space Station's final, major U.S. truss segment, Starboard 6 (S6), providing the power-generating capacity for a six-person crew to conduct increased science activities. With its two Solar Array Wings (SAWs) for converting solar energy into electrical power and a radiator for rejecting heat away from electrical components, the S6 is the final truss element and completes the station's 11-segment Integrated Truss Structure (ITS). Also called a Photovoltaic Module (PVM) because of its ability to generate, store and distribute electrical power to the station, the Starboard 6 segment will ensure the outpost is powered to its intended maximum potential. A unique feature about the S6 is that it will carry two spare Battery Charge/Discharge Units (BCDUs), used for controlling the charge and discharge of spare batteries on the station. The S6 segment was modified to carry the additional BCDUs, attached to the segment's Long Spacer Truss structure. The space station's solar arrays are the largest deployable space assemblies ever built and the most powerful electricity-producing arrays in orbit. Until deployed, each SAW remains folded in a special canister called a Solar Array Assembly (SAA) at the end of the S6 element. In the canister, each wing is equipped with an expandable mast. Two solar array blanket boxes, containing 32,800 solar cells, are connected to the ends of each canister and are restrained to the element frame for launch. The addition of S6 brings the station's total SAWs to eight. Each wing is 115 by 38 feet (35.1 by 11.6 meters) wide and, when all eight are fully deployed, will encompass an area of 32,528 square feet (3,022 square meters), minus the masts. The 310-foot (94.5 meters) integrated truss structure to which the S6 will be attached forms the backbone of the space station, with mountings for unpressurized logistics carriers, radiators, solar arrays, and the various elements. 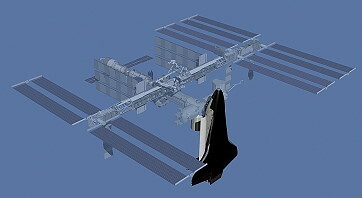 The 45-footlong S6 began as an operations test item for its twin sister, the Port 6 truss segment that was launched during Endeavour's STS-97 mission on November 30, 2000. The integrated truss segments started with Starboard 0 (S0) as the center assignment and were numbered in ascending order outward to the port (P) and starboard (S) sides. Starboard is the right side and port is the left side of the truss structure. Zenith (Z) is up, when the station is flying in its normal orientation. At one time, there was an S2 and a P2 planned, but they were eliminated when the station design was scaled back. From S0, the truss segments are P1, P3, P4, P5 and P6 and S1, S3, S4, S5 and S6. P6 is attached to P5, and once in orbit S6 was attached to S5. The S6 primary structure is made of a hexagonal-shaped aluminum structure and includes four bulkheads and six longerons, which are beams that connect the bulkheads. During the STS-119 mission, S6 was removed from the payload bay with the space station's robotic arm because the shuttle's arm is unable to remove the element with the current configuration of the station. The S6 element then was handed to the shuttle arm and maneuvered to another location, while the station arm changed base points. The S6 then was handed back to the station arm and maneuvered to an overnight park position. Removing the truss from the payload bay and maneuvering to an overnight park position took an entire day. The following day the truss was installed during a planned spacewalk. Once the final truss segment was attached, S6 supported power generation and energy storage, utility routing, power distribution and Orbital Replacement Unit (ORU) storage. Major subsystems of the S6 truss are the starboard outboard Photovoltaic Module (PVM), the Photovoltaic Radiator (PVR), the Long Spacer Truss (LST) and the Modified Rocketdyne Truss Attachment System (MRTAS). The S6 PVM includes all equipment outboard S5, namely the two Photovoltaic Array Assemblies (PVAAs) and the Integrated Equipment Assembly (IEA). The PVR provides thermal cooling for the IEA. The MRTAS is used to provide a structural interface to the S5 truss element. Each PVAA consists of a SAW and Beta Gimbal Assembly (BGA). S6 was the fourth and final of the four PVMs that convert sunlight to electricity in orbit. The primary functions of the power module are to collect, convert, store, and distribute electrical power to loads within the segment and to other station segments. Electrical power is a critical resource for the station because it allows astronauts to live comfortably, safely operate the station and perform complex scientific experiments. Since the only readily available source of energy for spacecraft is sunlight, technologies were developed to efficiently convert solar energy to electrical power. The PVMs use large numbers of solar cells assembled onto solar arrays to produce high power levels. NASA and Lockheed Martin developed a method of mounting the solar arrays on a "blanket" that can be folded like an accordion for delivery to space and then deployed to its full size once in orbit. The cells are made from purified crystal ingots of silicon that directly convert light to electricity for immediate use through a process called photovoltaics. Gimbals are used to rotate the arrays so that they face the sun to provide maximum power to the space station. After the conversion process, the PVMs also use the electricity to recharge onboard batteries for continuous sources of electricity while the station is in the Earth's shadow. Once complete, the station power system, consisting of U.S. and Russian hardware and four photovoltaic modules, will use between 80 - 100 kilowatts of power or about as much as 42 average houses (defined as 2,800 square feet of floor space using 2 kilowatts each). Some of the electricity is needed to operate space station systems, but once that is figured in, the addition of the S6 will nearly double the amount of power available to perform scientific experiments on the station - from 15 kilowatts to 30 kilowatts. There are two SAWs on the S6 module, each deployed in the opposite direction of the other. Each SAW is made up of two solar blankets mounted to a common mast. Before deployment, each panel is folded accordion style into a Solar Array Blanket Box (SABB) measuring 20 inches (51 centimeters) high and 15 feet (4.6 meters) in length. Each blanket is only about 20 inches (51 centimeters) thick while in this stored position. The mast consists of interlocking battens that are stowed for launch inside a Mast Canister Assembly (MCA). When deployed by the astronauts, the SAW unfolds like an erector set. Like a human torso, it has two arms when mounted on S6, and they are rotated outwards by astronauts during a spacewalk so they can be fully deployed. Because these blankets were stored for such a long time, extensive testing was conducted to ensure they would unfold properly in orbit so the blankets would not stick together. When fully deployed, the SAW extends 115 feet (35.1 meters) and spans 38 feet (11.6 meters) across and extends to each side of the Integrated Equipment Assembly. Since the second SAW is deployed in the opposite direction, the total wing span is more than 240 feet (73.2 meters). Each SAW weighs more than 2,400 pounds (1,089 kg) and uses 32,800 solar array cells, each measuring 8 centimeters square with 4,100 diodes. The individual cells were made by Boeing's Spectrolab and Aviation Systems Engineering Co. There are 400 solar array cells to a string and there are 82 strings per wing. Each SAW is capable of generating 32.8 kilowatts, or about 10.5 to 15 kilowatts of usable power. There are two SAWs on the S6 module capable of delivering a combined 21 to 30 kilowatts of usable power per PVM with a total of four PVMs on the station. The solar arrays produce more power than can be made available to the station's systems and experiments. Because all or part of the solar arrays are eclipsed by the Earth or station structure at times, batteries are used to store electricity for use during those periods. About 60 percent of the electricity generated is used to recharge the batteries. During long eclipse periods, power availability is limited to about 10.5 kilowatts from each SAW, or 30 kilowatts per PVM. During shorter eclipse periods more power is available to station systems and experiments. Circuit breakers also regulate the flow of electricity to prevent overheating of the Utility Transfer Assembly (UTA) that allows power to flow through the rotating SARJ. When the S6 truss is attached to the S5 short spacer, it will be positioned outboard of the starboard SARJ, which is designed to continuously rotate to keep the S4 and S6 solar array wings oriented toward the sun as the station orbits the Earth. Located between S3 and S4, the starboard SARJ is a 10.5-foot (3.2 meters) diameter rotary joint that weighs approximately 2,500 pounds (1,134 kg). The SARJ can spin 360 degrees using bearing assemblies and a servo control system to turn. Due to vibrations and damage found on its race ring, the starboard SARJ has been rotated only when needed. STS-126 astronauts cleaned and lubricated the race ring, and preliminary results show the joint is moving more freely. The race ring has a triangular cross-section on which 12 bearings roll. All of the power flows through the Utility Transfer Assembly (UTA) in the SARJ. Roll ring assemblies allow transmission of data and power across the rotating interface so it never has to unwind. The solar array wings also are oriented by the BGA, which can change the pitch of the wings by spinning the solar array. The BGA measures 3 x 3 x 3 feet (92 x 92 x 92 centimeters) and provides a structural link to the Integrated Equipment Assembly (IEA). The BGA's most visual functions are to deploy and retract the SAW and rotate it about its longitudinal axis. The BGA consists of three major components: the Bearing, Motor and Roll Ring Module (BMRRM), the Electronics Control Unit (ECU) and the Beta Gimbal Transition Structure, mounted on the BGA platform. The Sequential Shunt Unit (SSU) serves to manage and distribute the power generated from the arrays and is also mounted on each BGA platform. Both the SARJ and BGA are pointing mechanisms and mechanical devices used to point the arrays toward the sun. They can follow an angle target and rotate to that target in the direction toward the sun. Controllers in orbit continuously update those targets so they keep moving as the station orbits the Earth every 90 minutes, maintaining the same orientation toward the sun at the same orbital rate. The SARJ mechanism rotates 360 degrees every orbit, or about 4 degrees per minute, whereas the BGA moves only about four or five degrees per day. About two hours after Discovery attached to the forward docking port at the end of the station's Harmony module, hatches were opened between the two spacecraft to allow the 10 crew members to greet one another for the start of joint operations. Following a standard safety briefing by Michael Fincke, the crews went to work, activating a Station-to-Shuttle Power Transfer System that provided additional electricity to Discovery for the longer operation of shuttle systems. A few hours after hatch opening, Sandra Magnus and Koichi Wakata exchanged custom-made Russian Soyuz spacecraft seat liners. 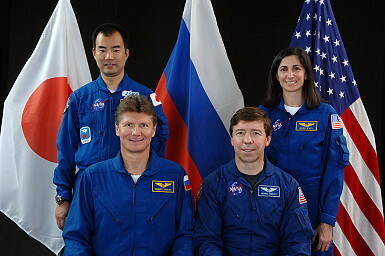 With that exchange, Koichi Wakata became a member of the Expedition 18 space station crew and Sandra Magnus became part of Discovery's crew. The first EVA by Steven Swanson and Richard Arnold occurred on March 19, 2009 (6h 07m). 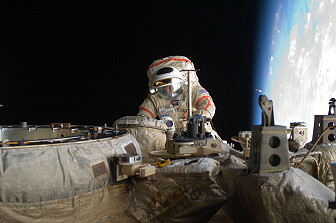 After Canadarm2 was released S6 and moved away, the spacewalkers plugged in power and data cables to connect the new hardware. The two spacewalkers also removed launch locks, stowed a keel pin, removed and jettisoned four thermal covers, and deployed the blanket boxes that hold the solar arrays in place during launch. The first spacewalk of the mission was devoted to installing the station's new truss segment and preparing the segment's solar arrays for unfolding on the eighth day of the mission. Steven Swanson and Richard Arnold moved to the S5 - or Starboard 5 - segment of the truss and made sure that the station's robotic arm had the new S6 truss segment in the correct position for its installation. It should be about 150 centimeters (4.9 feet) from the end of the S5 truss. From the robotic arm workstation inside the Destiny laboratory, John Phillips then moved the segment to a point 30 centimeters (11.8 inches) away from the end of the S5 truss, while Steven Swanson and Richard Arnold monitored clearances to ensure proper alignment. On their "go", John Phillips moved the segment to 15 centimeters (about 6 inches) for another check before making contact. Assuming everything is correctly aligned, Richard Arnold engaged a capture latch to allow the station's truss to support the new segment, rather than the robotic arm. Then Steven Swanson tightened the four bolts that attached the segment to the station, and Richard Arnold attached four S6 grounding straps to S5. With S6 safely attached to S5, Steven Swanson and Richard Arnold began hooking up the four connections that will allow power and data to pass from one segment to the other. After that, Steven Swanson and Richard Arnold split up. Richard Arnold released the restraints holding the blanket box that contained the solar array blankets, so that the arrays could be unfolded later. Steven Swanson, meanwhile, had two tasks. First he prepared the S6 radiator panels to be unfolded. He removed the six cinches that keep the panels folded together, and removed two pins that prevent them from unfolding. Afterward, flight controllers at the Mission Control Center in Houston were able to command the radiator to unfold. Steven Swanson then moved to the beta gimbal assembly - or BGA - which allows the solar array wings to twist as they track the sun. The BGA is kept from rotating during launch by a keel fastener. Steven Swanson removed the fastener so he could rotate the BGA into place for the unfolding on the solar array wings. After he did, he reinstalled the fastener and removed some launch restraints on the BGA. Steven Swanson and Richard Arnold then were reunited and rotated the blanket boxes into position for the unfolding of the arrays within them. Steven Swanson worked on the two boxes on the bottom, while Richard Arnold worked on the two on the top. Their last tasks were to remove thermal covers from the system's electronic control and sequential control units and jettison them behind the station to burn up in the Earth's atmosphere. 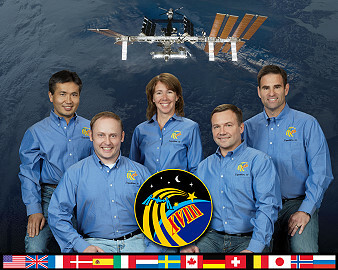 The second EVA was performed by Steven Swanson and Joseph Acaba on March 21, 2009 (6h 30m). First task during this spacewalk was to prepare a worksite for new batteries that will be brought up on the STS-127 mission. They loosened bolts, installed foot restraints. Steven Swanson installed a Global Positioning System antenna on the pressurized logistics module attached to the Kibo laboratory. They photographed areas of radiator panels extended from the Port 1 and Starboard 1 trusses and reconfigured connectors at a patch panel on the Zenith 1 truss that power Control Moment Gyroscopes. After struggling with a pin that kept an Unpressurized Cargo Carrier Attachment System (UCCAS) from fully deploying, they tied UCCAS safely in place. Steven Swanson and Joseph Acaba's first task during this spacewalk was to loosen two bolts on the battery on the P6 - or Port 6 - arrays. The battery was replaced during the STS-127 mission. From there, they continued working on the port side of the station's truss, on the bottom of the P3 segment, to prepare an unpressurized cargo carrier attachment system for use. The system allows cargo to be attached to the station's truss. To do so, the spacewalkers first removed brackets and pins holding the latch in place, moved the latch into position and then reinstalled the brackets and pins. Following that task, Steven Swanson worked on repairing a thermal cover over a quick disconnect on the first port segment's radiator beam valve module. Joseph Acaba, meanwhile, worked between the first and third port segments to install two fluid jumpers, by disconnecting them from the panels they're currently connected to and reconnecting them on new panels. The two spacewalkers then were reunited at the flex hose rotary coupler on P1 to release clamps holding the hoses down. This prepares the coupler, which transfers liquid ammonia across the joints that allow the station's radiators to rotate, to be replaced at a later date. After that work was complete, Steven Swanson and Joseph Acaba moved to the starboard side of the station's truss to prepare a payload attachment system for use on the top of the outboard side of the S3 segment, in a process similar to preparing the unpressurized cargo carrier attachment system for use. Both systems were used to attach equipment to the station's truss. 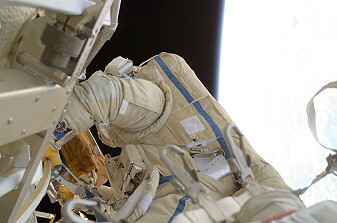 The final tasks of the spacewalk were for Steven Swanson to relocate a tool stanchion from the station's zenith truss segment to a worksite on the exterior of the Destiny laboratory, and for Joseph Acaba to retrieve a foot restraint on the zenith truss and bring it into the station's airlock. Flight day 8 was mostly used for a free day, although work on the Urine Processor Assembly continued and they had to avoid a piece of orbital debris (from a former Chinese satellite). 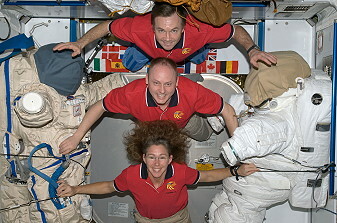 The third and final EVA by Richard Arnold and Joseph Acaba was performed on March 23, 2009 (6h 27m) to move one of the station's two Crew and Equipment and Translation Aid - or CETA - carts. The carts were moved to the port side of the station's truss during the previous mission to give the robotic arm's mobile transporter the best possible access to the starboard truss for the installation of the new truss segment and solar arrays. With that work done, one of the carts was moved back to the station's port side, leaving a cart for use on either side of the truss. The CETA cart also got a new coupler. The EVA also included lubricating the end effector capture snares on the station's robot arm - similar to what was done to the other end on an STS-126 spacewalk in late 2008. This has been proven to prevent the snare from snagging or not returning snugly into its groove inside the latching mechanism. Richard Arnold prepared the cart to be moved from P1 to S1 by releasing its brakes and wheel bogies. Joseph Acaba carried it to its new home on S1 aboard the station's robotic arm. Richard Arnold then moved to the site and was ready to help Richard Arnold reinstall the cart. Richard Arnold then took his turn on the station's robotic arm, which maneuvered him into place to work on the station's special purpose dexterous manipulator - also known as Dextre - on the exterior of the Destiny laboratory. Richard Arnold were re-securing two thermal covers on Dextre's orbital replacement unit tool changeout mechanism and removing a thermal cover on one of its electrical platforms. When he had done with that, he climbed off the robotic arm to lubricate the latching snares on its end effector, the mechanism that allows the arm to hold on to grapple fixtures or equipment. During the previous shuttle mission, the same lubrication was performed on the other end of the robotic arm - the arm has two end effectors, which allows it to move end-over-end to various worksites on the station. The snares have been experiencing some sticky spots that caused kinks in them, and during the previous mission, the lubrication was able to help clear up that problem. Richard Arnold used a grease gun to apply the lubrication and used needlenose pliers to maneuver the snares. While Richard Arnold was working on Dextre and the robotic arm, Joseph Acaba performed several tasks on the starboard truss, mirroring some of the work he and Richard Arnold did on the port side of the truss during the second spacewalk. He installed fluid jumpers between the S1 and S3 truss segments and released clamps on the S1 flex hose rotary coupler. He also swapped a bolt bus controller connector on the truss' segment-to-segment attach system. Richard Arnold and Joseph Acaba finished the spacewalk by replacing failed remote power control modules on the S0 and P1 truss segments. They were unable to deploy the Port 3 unpressurized cargo carrier attachment system (UCCAS). They secured the UCCAS in place until engineers can evaluate the problem. Mission Control cancelled the installation of a similar payload attachment system on the starboard side. On Flight day 11 they had a press conference with President Obama, students and members of the Congress. 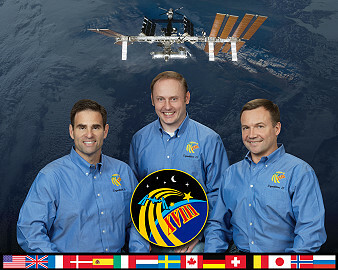 They also handled final transfers from Discovery to the ISS. On March 25, 2009 STS-119 undocked from the ISS and moved to a distance of about 450 feet (137.2 meters), where Anthony Antonelli began to fly around the station. Once Discovery completed 1.5 revolutions of the complex, Anthony Antonelli fired Discovery's jets to leave the area. The shuttle moved about 46 miles (74 km) from the station and remained there while ground teams analyzed data from the late inspection of the shuttle's heat shield. The distance was close enough to allow the shuttle to return to the station in the unlikely event that the heat shield is damaged, preventing the shuttle's safe re-entry. Bisphosphonates as a Countermeasure to Space Flight Induced Bone Loss (Bisphosphonates) will determine whether antiresorptive agents, or those that help reduce bone loss on Earth, in conjunction with the routine in-flight exercise program, will protect station crew members from the bone loss documented on previous missions. 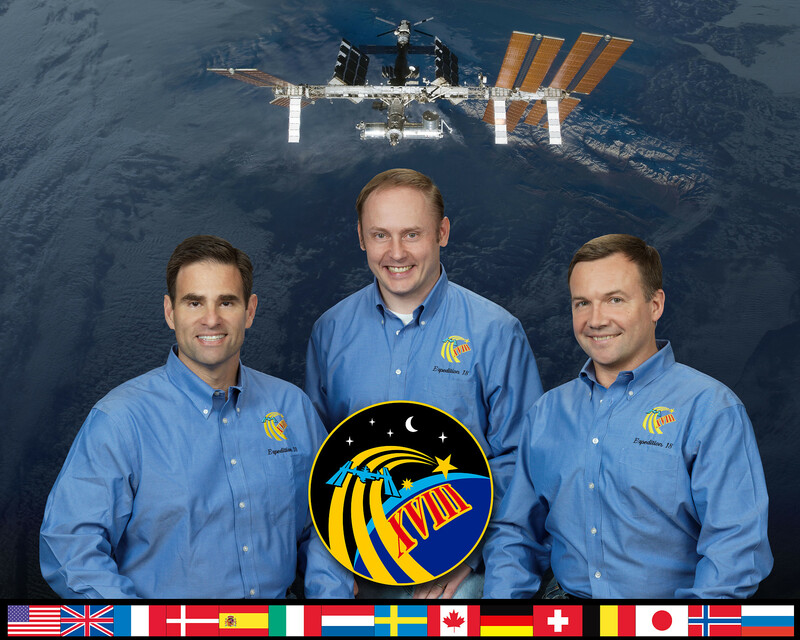 Validation of Procedures for Monitoring Crew Member Immune Function (Integrated Immune) will assess the clinical risks resulting from the adverse effects of spaceflight on the human immune system. The study will validate a flight-compatible immune monitoring strategy by collecting and analyzing blood, urine and saliva samples from crew members before, during and after spaceflight to monitor changes in the immune system. Test of Midodrine as a Countermeasure Against Postflight Orthostatic Hypotension - Long (Midodrine-Long) measures the ability of the drug midodrine, as a countermeasure, to reduce the incidence or severity of orthostatic hypotension, or dizziness caused by the blood pressure decrease that many astronauts experience when returning to Earth's gravity. Nutritional Status Assessment (Nutrition) is NASA's most comprehensive in-flight study to date of human physiologic changes during long-duration spaceflight. This study will impact both the definition of nutritional requirements and development of food systems for future space exploration missions to the moon and beyond. This experiment also will help researchers understand the impact of countermeasures, such as exercise and pharmaceuticals, on nutritional status and nutrient requirements for astronauts. The National Aeronautics and Space Administration Biological Specime Repository (Repository) is a storage bank used to maintain biological specimens over extended periods of time and under well-controlled conditions. Samples from the station, including blood and urine, will be collected, processed and archived during the preflight, in-flight and postflight phases of the missions. This investigation has been developed to archive biological samples for use as a resource for future spaceflight research. Stability of Pharmacotherapeutic an Nutritional Compounds (Stability) studies the effects of radiation in space on complex organic molecules, such as vitamins and other compounds in food and medicine. This could help researchers develop more stable and reliable pharmaceutical and nutritional countermeasures suitable for future longduration missions. Multi-User Droplet Combustion Apparatus - Flame Extinguishment Experiment (MCDA-FLEX) will assess the effectiveness of fire suppressants in microgravity and quantify the effect of different possible crew exploration atmospheres on fire suppression. This will provide definition and direction for large-scale fire suppression tests and selection of the fire suppressant for next-generation crew exploration vehicles. Materials on the International Space Station Experiment 6 A and B (MISSE-6A and 6B) is a test bed for materials and coatings attached to the outside of the space station that are being evaluated for the effects of atomic oxygen, direct sunlight, radiation and extremes of heat and cold. This experiment allows the development and testing of new materials to better withstand the rigors of space environments. Results will provide a better understanding of the durability of various materials in space, leading to the design of stronger, more durable spacecraft components. Pico-Satellite Solar Cell Experiment (PSSC) is designed to test the space environment effects on new solar cell technologies for applications in the design of future spacecraft. It will provide a better understanding of the durability of various solar cell materials when they are exposed to the space environment. Shuttle Exhaust Ion Turbulence Experiments (SEITE) will use space-based sensors to detect turbulence inferred from the radar observations from a previous space shuttle Orbital Maneuvering System burn experiment using ground-based radar. The research will enhance detection, tracking and timely surveillance of high interest objects in space. Smoke Point In Co-flow Experiment (SPICE) determines the point at which gas-jet flames, similar to a butane-lighter flame, begin to emit soot in microgravity. Studying a soot-emitting flame is important in understanding the ability of fires to spread in microgravity. The Optimization of Root Zone Substrates (ORZS) for Reduced Gravity Experiments Program was developed to provide direct measurements and models for plant rooting instructions that will be used in future advanced life support plant growth experiments. The goal is to develop and enhance hardware and procedures to allow optimal plant growth in microgravity. Shear History Extensional Rheology Experiment (SHERE) is designed to investigate the effect of preshearing, or rotation on the stress and strain response of a polymer fluid - a complex fluid containing long chains of polymer molecules - being stretched in microgravity. The fundamental understanding and measurement of these complex fluids is important for fabrication of parts on future exploration missions. Crew Earth Observations (CEO) takes advantage of the crew in space to observe and photograph natural and human-made changes on Earth. The photographs record the Earth's surface changes over time, along with dynamic events such as storms, floods, fires and volcanic eruptions. 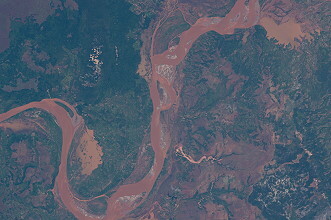 These images provide researchers on Earth with key data to better understand the planet. Crew Earth Observations - International Polar Year (CEO-IPY) supports an international collaboration of scientists studying the Earth's polar regions from 2007 to 2009. Space station crew members photograph polar phenomena including icebergs, auroras and mesospheric clouds in response to daily correspondence from the scientists on the ground. Commercial Generic Bioprocessing Apparatus Science Insert - 02 (CSI-02) is an educational payload designed to interest middle school students in science, technology, engineering and math by participating in near real-time research conducted aboard the station. Students will observe four experiments through data and imagery downlinked and distributed directly into the classroom via the Internet. The first experiment will examine seed germination and plant development in microgravity. It will be followed by an experiment to examine yeast cells' adaptation to the space environment; another will examine plant cell cultures; and the final experiment, a silicate garden, will examine crystal growth formation using silicates, or compounds containing silicon, oxygen and one or more metals. Commercial Generic Bioprocessing Apparatus Science Insert - 03 (CSI-03) provides K-12 teachers opportunities to use the unique microgravity environment of the space station as part of the regular classroom to encourage learning and interest in science, technology, engineering and math. CSI-03 will examine the complete life cycle of the painted lady butterfly and the ability of an orb-weaving spider to spin a web, eat and remain healthy in space. Earth Knowledge Acquired by Middle School Students (EarthKAM), an education experiment, allows middle school students to program a digital camera aboard the station to photograph a variety of geographical targets for study in the classroom. Photos are made available on the Web for viewing and study by participating schools around the world. Educators use the images for projects involving Earth science, geography, physics and technology. Maui Analysis of Upper Atmospheric Injections (MAUI) observes the space shuttle engine exhaust plumes from the Maui Space Surveillance Site in Hawaii. The observations will occur when the shuttle fires its engines at night or twilight. A telescope and all-sky imagers will collect images and data while the shuttle flies over the Maui site. The images will be analyzed to better understand the interaction between the spacecraft plume and the upper atmosphere. National Lab Pathfinder - Cells (NLP-Cells) comprises two experiments conducted by the U.S. Department of Agriculture aimed at understanding the effects of microgravity on living systems. One experiment will assess the effects of spaceflight on cattle cells. 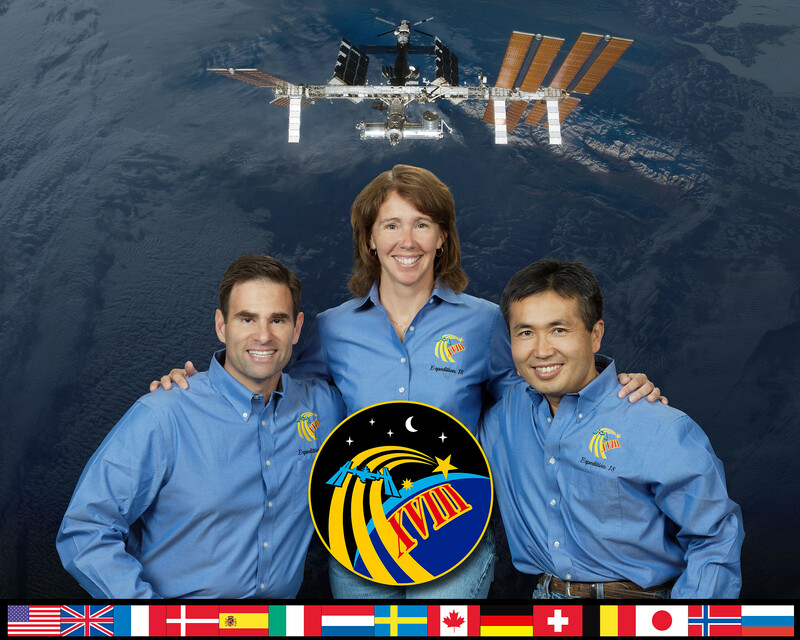 The other experiment examines the effects of spaceflight on liver cells. 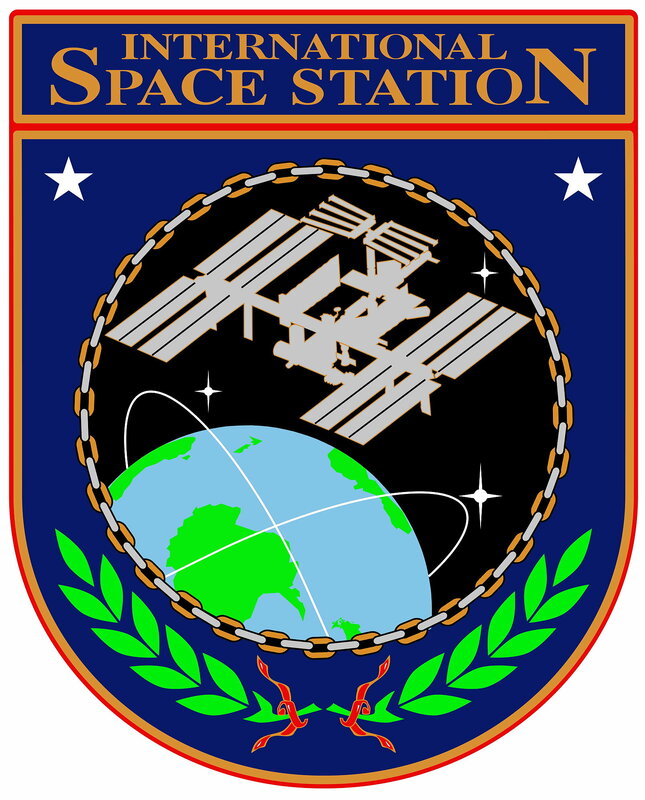 National Lab Pathfinder - Vaccine 2 (NLP-Vaccine 2) is a commercial payload serving as a pathfinder for use of the space station as a National Laboratory after station assembly is complete. This payload contains a pathogenic, or disease-carrying organism, and tests whether the organism changes in microgravity in a way that allows it to become a viable base for a potential vaccine against infections on Earth and in microgravity. Validation of Procedures for Monitoring Crew Member Immune Function - Short Duration Biological Investigation (Integrated Immune - SDBI) will assess the clinical risks resulting from the adverse effects of spaceflight on the human immune system for space shuttle crew members. The study will validate a flight-compatible immune monitoring strategy by collecting and analyzing blood, urine and saliva samples from crew members before, during and after spaceflight to monitor changes in the immune system. Shuttle Ionospheric Modification with Pulsed Localized Exhaust Experiments (SIMPLEX) will investigate plasma turbulence driven by rocket exhaust in the ionosphere using ground-based radars. Sleep-Wake Actigraphy and Light Exposure During Spaceflight - Short (Sleep-Short) examines the effects of spaceflight on the sleep-wake cycles of the astronauts during space shuttle missions. Advancing state-of-the-art technology for monitoring, diagnosing and assessing treatment of sleep patterns is vital to treating insomnia on Earth and in space. On March 28, 2009 Russian spacecraft Soyuz TMA-14 brought the two new crewmembers of Expedition 19 to the station. Finally the station command changed from US astronaut Michael Fincke to Russian cosmonaut Gennadi Padalka. 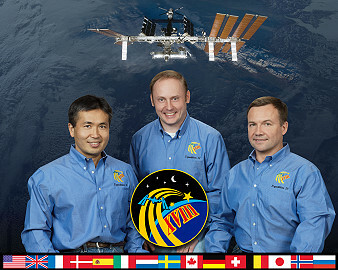 Expedition 18 offically ended with undocking of Soyuz TMA-13 on April 08, 2009 at 02:55:30 UTC. Zhenshen-2 (Study of the Development of Cell Cultures to Evaluate the Possibily of Increasing Biological Activity).